Have you ever been sitting at your desk at work and felt overwhelming anxiety? It can often feel like you can’t escape the racing thoughts and excessive worry as you are stuck trying to complete your work. You may feel like you can’t just get up and leave to go for a walk or get some air, so what can you do? 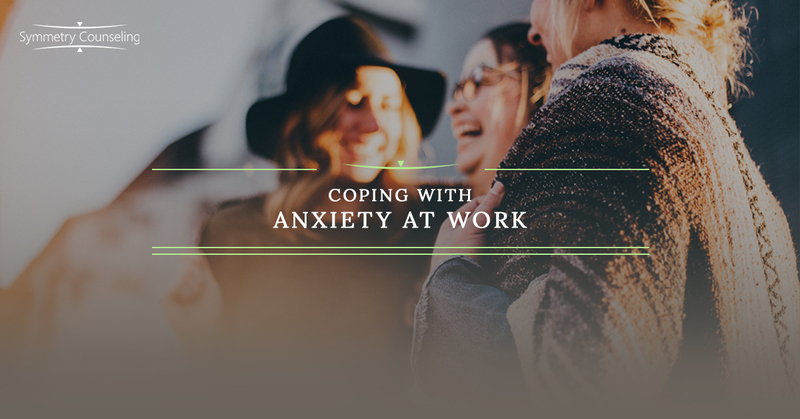 Anxiety can be debilitating in all areas of life and work is no exception. You have stressful meetings, fear of not doing a good job, worry about messing up, are constantly thinking about what you have to do next, etc. It is important to be able to manage your anxiety when you are at work so you aren’t counting down the minutes until you can leave. Below are a few tactics you can use at work to cope with anxiety throughout your day. Take some time to notice what makes your anxiety skyrocket. Is it when you meet with your boss? Is it when you feel not good enough or unorganized? When you understand what impacts you the most it becomes easier to anticipate and prepare for. It may be helpful to write down the times you feel anxious and what you think is the root cause. After a while, you will begin to notice some patterns of what triggers you most of the time. When you get triggered and feel anxious your body is in a heightened state. To bring it back to normal you need to use the techniques that work best for you such as breathing exercises, mindfulness, and muscle relaxation techniques. Some of these techniques include the 4-7-8 breathing technique, focusing on the present moment using your senses, and tensing then relaxing your muscles gradually. If possible taking a quick ten-minute break would be best, but if not, you can breathe anywhere. Just begin taking control with some of these exercises and you will notice your anxiety symptoms begin to dissipate. Anxiety can leave you feeling distracted and overwhelmed with things you “should” be doing. It can be helpful to create a list of things you would like to get done at the beginning of each day and refer to it throughout the rest of the day. Setting small goals for yourself every day can help you stay focused and feel accomplished rather than defeated. Reset your thoughts by redirecting to what you want to work on. Regardless if you struggle with anxiety or not, communicating your needs at work is crucial to your mental health. If you are feeling stressed, need more time on a project, or feel overworked, communicate this to your boss. Filling them in on how you are doing and what you need is important in terms of managing your anxiety. If you and your coworkers know what to expect you can feel more prepared and worry less. If you are currently overwhelmed with your anxiety symptoms and would like some support, it may be useful to connect with a therapist. Contact Symmetry Counseling at 312-578-9990 to set up an appointment with one of our very skilled therapists today!